Once the concrete is in place, the site should be cleared of tools, equipment, and any debris that accumulated during the pour. Fencing, barriers, and safety controls should be replaced where they’ve been removed and the batter boards and workpoint checked for damage. It’s also important to remove the formwork as soon as possible, but only as quickly as the weather will allow. In general, stripping immediately makes it easier to remove and clean the forms and allows the concrete to cure evenly. Waiting too long can weaken the concrete because of uneven curing and make it difficult to reuse the forms. Unless it’s extremely cold, a chemical reaction occurs that prevents the concrete from freezing, but the footing’s surfaces can also dry out if it cures too quickly. This makes timing critical and it takes experience to know when it’s best to strip the forms. Hands-on builders consider the weather and feel the warmth of the concrete before making a judgment as to the best way to protect the concrete as it cures. 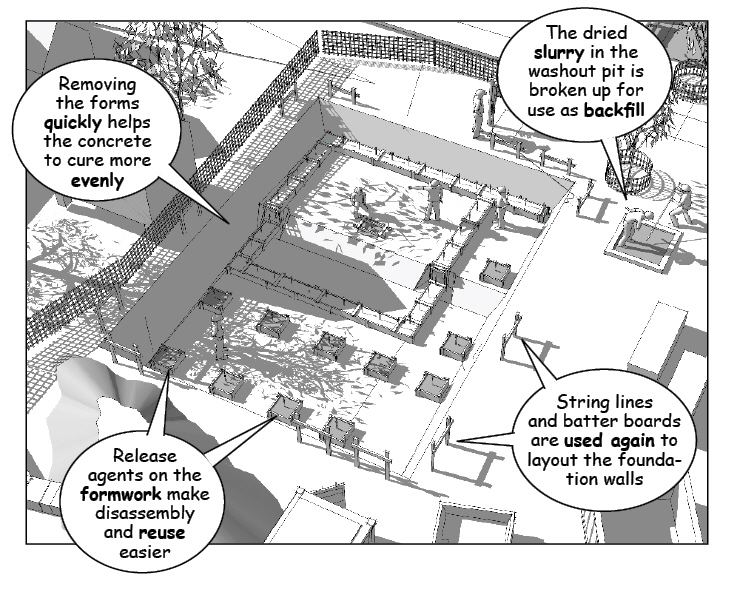 All of this can be avoided with an interesting innovation in concrete formwork. 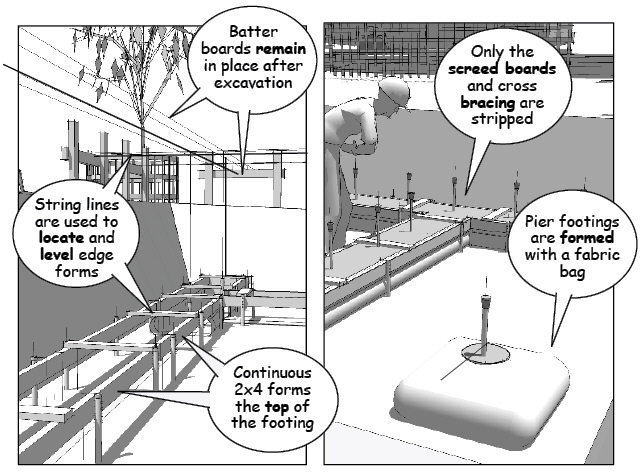 Of course, it takes a long time in the construction industry to change established methods, but some innovations suggest a particularly logical approach to conventional practice. 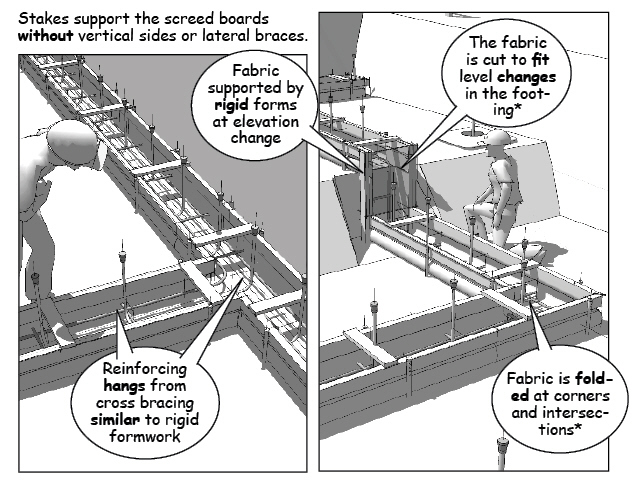 Fabric forms use tensile membranes instead of rigid members. Concrete is contained by the geometry of the fabric, forming structural curves as pure tensile elements and ideal parabolic shapes for foundation footings. The fabric also adapts to uneven ground and uses far less material to hold the wet concrete in place. The permeable material also allows the concrete to cure evenly with a smooth finish, reducing labor, transportation, and storage. Better yet, stripping is reduced to stakes, spreaders, and runners that are easily removed and reused in the framing as blocking. Trying something new depends on the type and volume of work, design of the foundations, and interests of the builders who might want to give an idea like this a try. 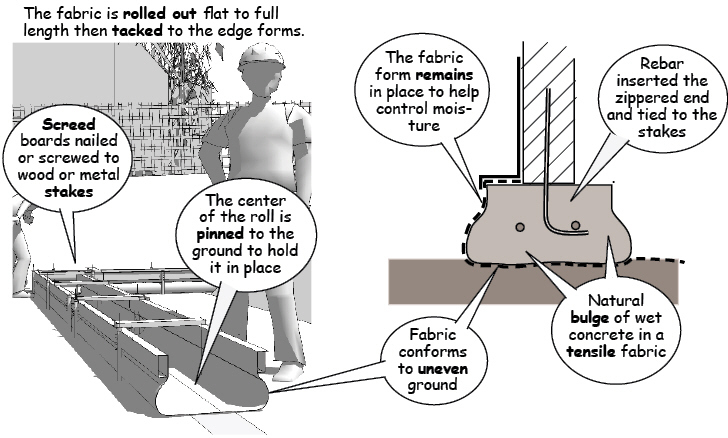 For more information, see installation diagrams and videos at www.fab-form.com and an association website at www.fabricforming.org.